In 1994 the Ebola’s eerie silence was broken when it reappeared in Gabon and Cote d’Ivoire. The single human case in Cote d’Ivoire occurred when a 34-year-old female Swiss ethologist contracted the disease while conducting a necropsy on a chimp that had died from a suspected outbreak of Ebola amongst a troupe of Chimpanzees in the Tai Forest near Liberia. Once symptoms appeared, physicians quickly transferred her to Switzerland where she soon made a full recovery without infecting anyone else (a precedent for the two Americans with Ebola currently being transferred back to the US). This solitary case is significant because it is the only known human instance of Tai ebolavirus, and, prior to 2014, was the only known Ebola case in West Africa despite many news agencies reporting that this year’s outbreak is the first West African Ebola episode. In Central Africa, the three chimpanzee-linked cases that occurred in Gabon between 1994 and 1995 were all relatively isolated, each infecting less than 60 people, but one victim did travel to Johannesburg where he infected a nurse who died days later without further passing on the disease. This episode provides a precedent for fears that the 2014 outbreak may travel far beyond the initial index case via international air travel, however the case was quickly contained to a single transmission. 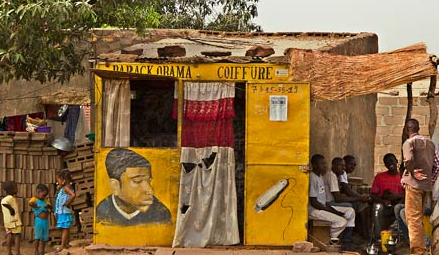 A brief interview with Andrew Esiebo about his latest photography project: West African barbershops, one of the most consistent and ubiquitous forms of architecture and public art in African cities.